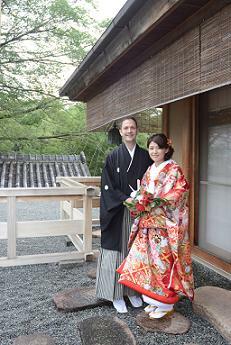 I have supported the wedding reception at Ryotei SAAMI after the wedding ceremony at Yasaka shrine. 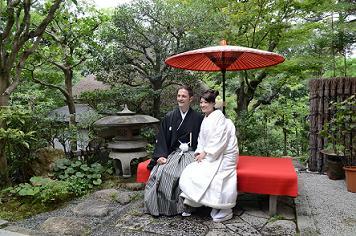 It was the bride and groom who has had their location photo shooting on 30th of August. 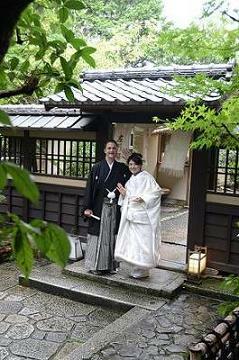 On the day of photo shooting, they worn western wedding gown and tuxedo, but on their wedding day, they worn Japanese wedding outfits (which was Shiromuku, Irouchikake and Montsuki-hakama) so they look very different from the western style but they very suited on their Japanese style wedding outfits. The bride had told me that she is really worried about typhoon, but after their preparation got ready and took photograph at SAAMI and when they leave, and also arrvie, the rain had stopped. Also, the groom’s guests from abroad had said “It was wonderful reception. The meals were delicious too” with satisfaction, so we were all happy hearing those words. And when the bride read the letter to her mother and father, and when the groom has speeched their gratitude as ending speech, all of the guests and staffs have moved to their words. As hearing the letter, I remember the day we first met, and the things we have talked during the arrangements. I know that it was a very hard task for them for preparing for the wedding while both of them working. 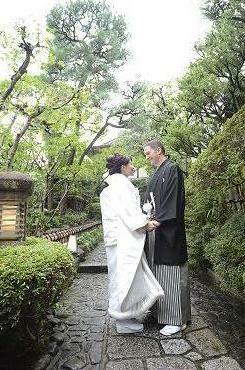 I think that both Japanese and abroad guests enjoyed the day was because they have felt the feeling of bride and groom’s caring about them by writing message on each place card and the photographs decorated on the waiting spaces. On the day of hair & make-up rehearsal, the bride told me that she was worried for the days after the wedding when I could not be by their sides, but I know that groom would always encourage the bride, and tell her jokes, and he is such a fun man, the life with him would be very bright everyday!! Whenever you come to Kyoto, please come by anytime. I am very glad to have met with you.